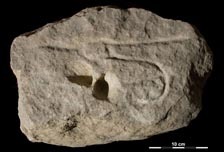 Rock engravings discovered at Abri Castanet, in southern France, have been dated to 37,000 BP, making them the earliest known examples of wall art in the world. According to research by an international team of anthropologists from European and American universities, they predate the famous paintings at the Grotte Chauvet, in southeast France, previously believed to be the oldest. The limestone engravings at Abri Castanet were discovered in 2007 on a 1.5 ton limestone block on the ceiling of the shelter that, at about 1.7m high, would have been within easy arm’s reach of the artist. They comprise mainly rough etchings and ochre daubs of horses and the female genitalia – a far cry from the intricate animal drawings discovered in 1994 at Grotte Chauvet. The paintings are associated with the Aurignacian culture, the first modern human culture to populate Europe after the Neanderthals, active from about 38,000 BC to 26,000 BC. Investigation at Abri Castanet site and nearby Abri Blanchard revealed other examples of their aesthetic artefacts, including pierced animal teeth and shells, and ivory and soapstone beads, which would have been used for personal adornment. Radiocarbon dating techniques established that both the ceiling and the finds recovered from the living surface below date to c.37,000 years ago. Aurignacian sites in Europe, including Abri Castanet, have sparked a debate about the significance of art as an adaptive trait to all human societies, both ancient and contemporary. ‘There is a whole question about how and why – and why here in this place, at this particular time – you begin to see people spending so much time and energy and imagination on the graphics,’ White says.